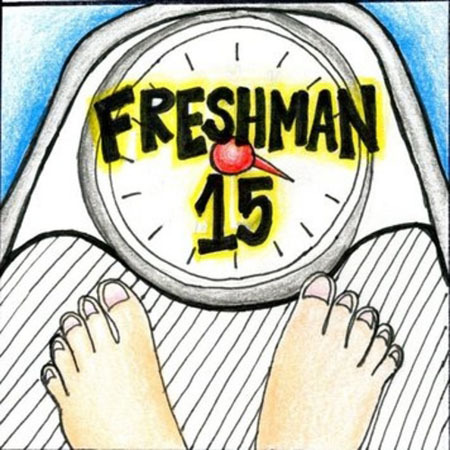 We’ve all heard of the dreaded freshman 15 before. The unfortunate saying that when you come to college, you’re going to gain a crazy amount of weight. However, it doesn’t have to be like this if you keep a few things in mind. As a freshman, D-Hall and E-Hall are awesome. All you can eat soda, pizza, pasta, sweets, and endless brunch on the weekends. While you can still enjoy all that, it is important to remember your portion control. For serving sizes compared to everyday objects, refer to this resource: http://www.eatright.org/resource/food/nutrition/dietary-guidelines-and-myplate/portion-distortion. To resist the temptation of overeating, try to eat at dining halls like Bistro 1908, Festival, or Dukes, where you are given a set amount of food for a punch. Empty calories are calories that come from food with little or no nutritional content. This includes cakes, candy, cookies, sugar sweetened beverages including soda and Red-Bull, and alcohol. Empty calories are one of the leading causes of weight gain. They are also only a quick-fix for hunger. Try more nutrient dense foods with long lasting energy if you are hungry such as nuts, fruit, or yogurt. These foods contain fiber, which helps us stay fuller longer. While it is hard to eat breakfast as a college student waking up at all different hours in the morning, it should become a priority. Eating breakfast kick starts our metabolism for the day, and really wakes up our bodies and brain. A good breakfast consists of carbohydrate, protein, and fat which helps keep you full longer. An example is an egg on a whole-wheat English muffin with American cheese and a cup of milk. An egg can be microwaved in a cup for 40 seconds easily in a dorm. An example of a breakfast that wouldn’t sustain energy is just a bowl of cereal, which is only carbohydrate. You’re a freshman and just want to blow all of your dining dollars on Auntie Anne’s, Dunkin Donuts, and Starbucks, I understand. First off, you’ll regret blowing through all those dining dollars very quickly, I promise. Buy a few snacks to keep in your backpack throughout the day so that you are less tempted to eat something less nutritious. Examples of snacks include BelVita Bars, peanut butter and cracker sandwiches, trail mix, or fruit such as apples or bananas.